Southern and West Central Europe, where pillars of Occidental culture emerged, is going to be my current destination for holidays from now on, because of its avenues full of history, invaluable artworks, and monuments, and its memorable, lifetime experiences, lived with the wonderful SEK Quito's crew of students and teachers. Paris, where the roots of revolutions and democracies were established, was my favorite destination because you can track nowadays French Republic's position through very remote historical events. Italy, the abode of pizza, renaissance, and ancient monuments, was another memorable destiny, mainly because of its rich culture. Finally, Spain the last of our tour but not least. The Iberian Peninsula was home of several religious groups such as Muslims, and Catholics. This unique fusion was evident at the medieval town of Toledo, where you can find churches near of mosques or synagogues. The cultural tour was a complete success. 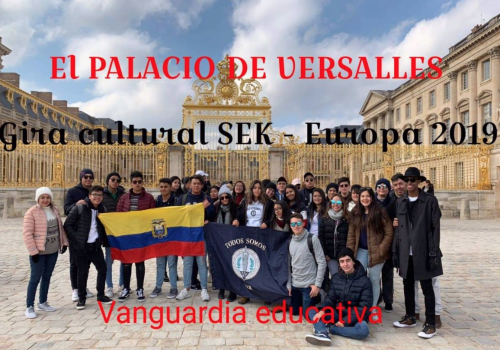 An experience like never before in my opinion, and it wouldn't be possible without the coordination of our SEK Quito's teachers, who were very open with us at the time we met them. Nevertheless, Leandro Abascal, our tour guide, played the most important role. Leandro was excellent scheduling our visits and guiding us. He knew very well the tourist spots, got to handle us to be in time, and of course, he became respected and loved. On behalf of SEK Los Valles crew of students, I want to thank this great effort!